President Donald Trump imposed new tariffs on $US50 billion worth of Chinese goods on Thursday, and China announced it will respond in kind. Trade experts and economists warn the fight between the two countries could be protracted and damaging. One even compared it to the Trump administration’s possible version of a long, seemingly unending conflict like the war in Afghanistan. President Donald Trump last week fired the latest and perhaps most direct attack at China in an emerging trade battle, announcing new tariffs on $US50 billion worth of Chinese goods in what economists say could be the start of a long, drawn-out conflict between the two superpowers. The move came in response to an investigation into the theft of US intellectual property by the Chinese government and state-controlled companies. The China-specific tariffs also follow action from the administration imposing trade restrictions on all imports of steel and aluminium, with exemptions for a handful of allies. The Chinese government announced tariffs of their own on a range of agricultural and industrial products from the US and promised another response to Thursday’s tariffs. Given the tough talk and escalating action from both sides, a trade war appears almost inevitable. Experts warn the the effects could define Trump’s economic legacy. While trade experts and economists questioned Trump’s choice of tariffs to go after China, their bigger concern is that there is no end in sight for the trade conflict. Adam Posen, the president of the Peterson Institute for International Economics, wrote last week that the most worrying aspect is that there doesn’t appear to be a defined goal for success. 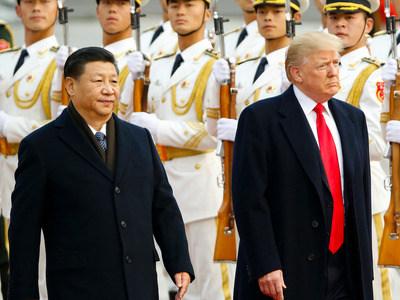 Trump has spoken vaguely about reducing the trade deficit with China and even asked visiting Chinese officials to produce a plan to cut the $US375 billion trade imbalance between the two countries by $US100 billion. But Trump has not provided any specific parameters for success. The lack of clarity could lead to a protracted trade war with severe economic consequences for the US, said Edward Alden, a senior fellow at the Council on Foreign Relations. The longer that the conflict goes on, the more likely it is to hurt US consumers. The history of tariffs in the US does not paint an encouraging picture. The broad tariffs of the 1930s are widely accepted as disastrous for that economy, and even targeted tariffs designed to protect the steel industry imposed by presidents over the past 40 years proved to be ineffective at best, studies say. While economists estimate Trump’s new tariffs may shave off only a small amount of US economic growth, a broader fight could be more damaging and could even push the US economy into recession. A fight between the US and China could also broaden, since many countries rely on exports to China. For example, Australia derived just under 19% of its total 2017 GDP by exporting goods and services – one-third of those exports were sent to China. Many of Australia’s exports are raw goods, some of which are processed into finished goods and shipped to the US. That means Australia, and other Chinese trading partners, could get caught in the crosshairs and make the conflict global. On March 5, World Trade Organisation Director General Roberto Azevedo warned that a prolonged protectionist path could have global consequences. For now, there does not appear to be a finish line. In fact, Trump promised even more blows in the near future.